Update: The Huawei P30 and P30 Pro have just earned their places in our best smartphone rundown - read on to find out where they placed. There are plenty more top-flight smartphones claiming to offer the best experience on their way too, with the likes of the Nokia 9 Pureview, Galaxy Fold, LG G8 ThinQ, LG V50 ThinQ and Huawei Mate X having all been announced. 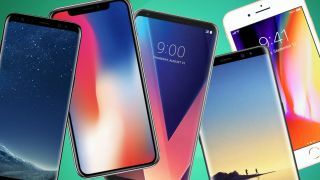 However, if your smartphone replacement simply can't wait you'll be asking, what are the 15 best smartphones available right now? Read on to find out. We know that it's not all about the high-cost, super spec phones all the time so we've made you a handy list of all the top smartphones that you can get on the market right now, assessing what really matters to you, the buyer. We test these phones rigorously, making sure that we check every angle and feature - but most importantly, considering whether they've got a decent battery, great screen, strong design and a cracking camera. On top of that, they can't be too exorbitant in price either - not everyone wants or can afford a supercar of a handset, so we've made sure there are plenty of options for you there. Still here? Still thinking about which phone to go for? Don't worry... there are 15 excellent options to choose from. It's a big phone that's designed for big hands - and it takes the very best of what's on the smartphone market and puts it together in a compelling package that we've loved testing. Plus, there's a fingerprint scanner embedded in the display. Battery life: The battery life on the Galaxy S10 Plus is and improvement over the S9 Plus, thanks to the larger 4,100mAh battery inside. It'll easily reach bedtime with double digits still left in the tank. The S10 Plus also offers Samsung's new Wireless PowerShare, allowing you to wirelessly charge other devices on the rear of the handset.